Morris, Gary L. Handy Mississippi Genealogy Handbook. s.l. : s.n., 2015. As I was browsing at Amazon this week, I discovered an entry for a book on Mississippi genealogical research previously unknown to me. Even though the book was described as being 38 pages and costing $5.99, I decided to purchase it. When the book arrived, it really only had 36 pages. The book relies heavily upon Access Genealogy resources. Most other information is a listing of URLs or addresses. The layout and formatting is confusing. The author uses the same heading style for sections as for the actual resource, making much of the information seem duplicated. Descriptions are not very useful and information provided is not complete enough to be useful at even a basic level. The final section of the book provides a listing of common Mississippi surnames -- or what is SUPPOSED to be a listing of common Mississippi surnames. Instead, it is a listing of counties. Don't waste your money on this volume! What little useful information included can be found easily on the Internet. 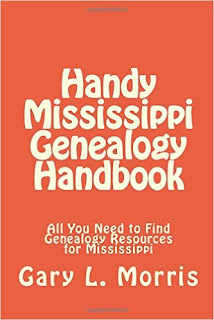 Those wanting a book on Mississippi research are better off purchasing the dated Tracing Your Mississippi Ancestors by Anne S. Lipscomb and Kathleen Hutchison.